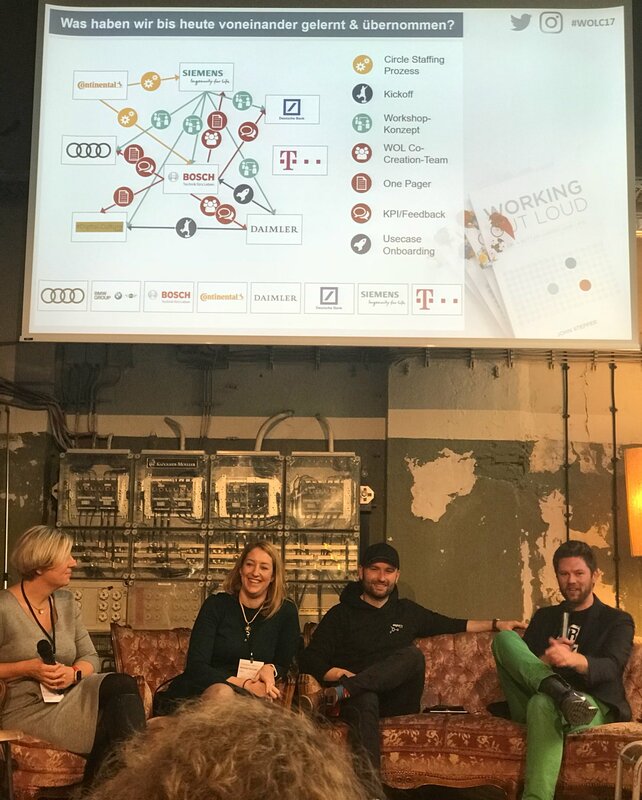 A couple of days ago I had the chance to participate in the first Working-Out-Loud Barcamp in Germany. 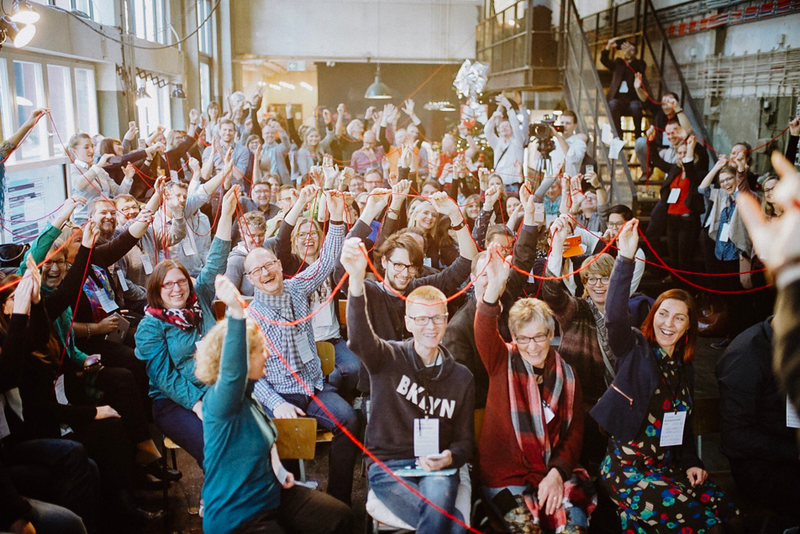 If you have never heard about WOL, in a nutshell it is about „building relationships that matter“ by sharing your work openly and widely and generously offering help to others. I am normally not someone who talks much in superlatives but this WOL Barcamp truly was unique on many different levels. 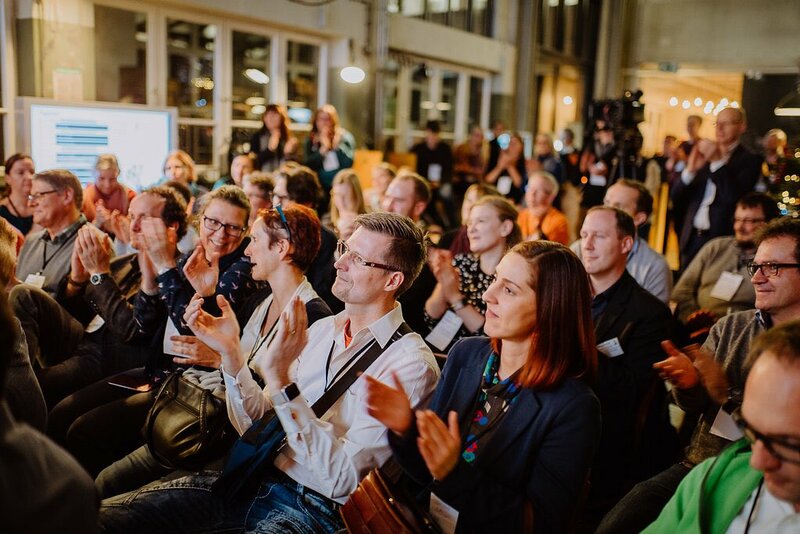 Very much in line with the purpose and effects of WOL, the event was about sharing, learning, connecting, supporting, energising and mobilising like-minded people. Of course, it was also about promoting WOL and having fun. As many as 106 people from over 48 different companies participated in the barcamp. United by a common purpose (see above) it was not about ego but eco. WE was certainly greater than ME. 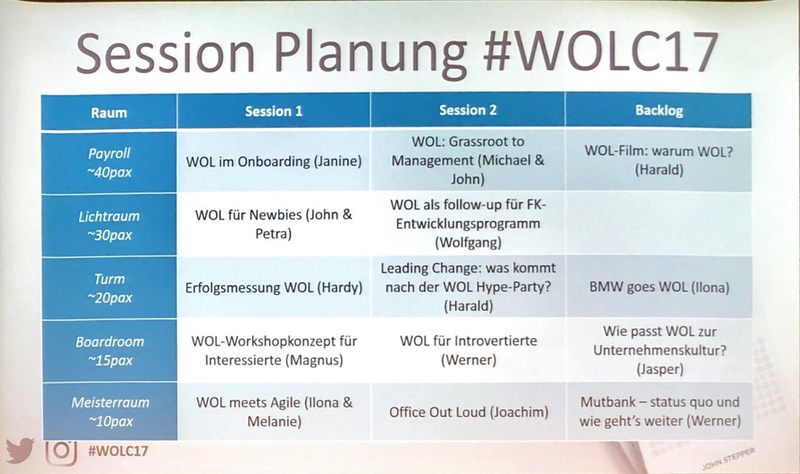 As far as I could tell from my conversations, overhearing others’s discussions and participating in two sessions there was no one boosting about his achievements, the „size/length“ of his #WOL experience or looking down on people that have not yet started their WOL journey. Everyone seemed to be genuinely interested in the other person and his story, no matter whether they were WOLnewbies or WOLexperts. What made the barcamp even more enjoyable was the fact that many attendees, me included, were already connected with others in online channels and it was the first time to finally meet offline. Bonus point: You don’t start with clumsy questions like „Where do you work?“, „What do you do?“, „What do you want to learn here?“. It felt more like a big family reunion, but in this case with family members that you were able to choose. Yes, it was not just about happy-clappy, hello-hello, but also about interesting content. Since it was a barcamp the attendees created and decided on the agenda. 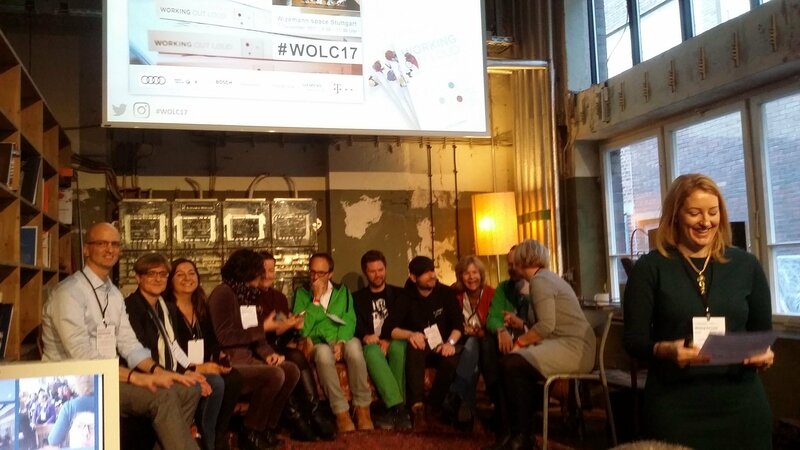 The session organiser, Magnus Rode, invited us to share and discuss approaches on how to best run a WOL workshop for prospective leaders. It was a lively conversation, in which participants shared their learnings and suggestions from similar situations. Magnus documented it in this wiki. Joachim Haydecker invited to this session. He is currently involved in helping employees of a big company to become comfortable with and productive on Office 365. Inspired by the key aspects of Working Out Loud he was looking for ways to use John Stepper’s WOL method to accelerate the learning process and make it more sustainable. I left the conversation early because it reminded me at times of the saying „if all you have is a hammer, everything looks like a nail“. Leading Change: What comes after the WOL Hype? Logically, I went into the session about WOL and hype to ground myself again. It was the antidote to the session before. I missed the introduction by the organiser Harald Schirmer and first 20 minutes of the conversation. When put on the spot and among others under the impression of the previous session I did exclaim that WOL certainly did feel like a hype. Having had time to reflect on it afterwards, I believe the answer needs to be more nuanced than that. I feel a separate blog post coming. John Stepper gave an inspiring keynote about his personal story of how he experienced unhappiness in his corporate jobs, how WOL has helped him to find happiness again and how WOL inspires others to do the same. For him it is not about large-scale change but the impact that he and others can have on people one is directly and sometimes even indirectly connected with. You have an intimate event of about 100 attendees, people united by the same purpose that want to learn but also care to share. What could go wrong with that? Nothing! The anticipation for the event was mounting as it drew closer. About 50 attendees met for dinner the night before. Smiles, hugs, lively and lovely conversations everywhere. The next day the same happened. The energy level was sky high from the beginning and maintained its level throughout the day, even through the dreaded afternoon lull. When people left they were energised and mobilised and ready to take on the (corporate) world with its imperfection and inhumanity. What I find astonishing is the the fact that these individuals worked on it alongside their day job at their respective company. It needs high levels of commitment and belief to pull off such inspiring and valuable event. 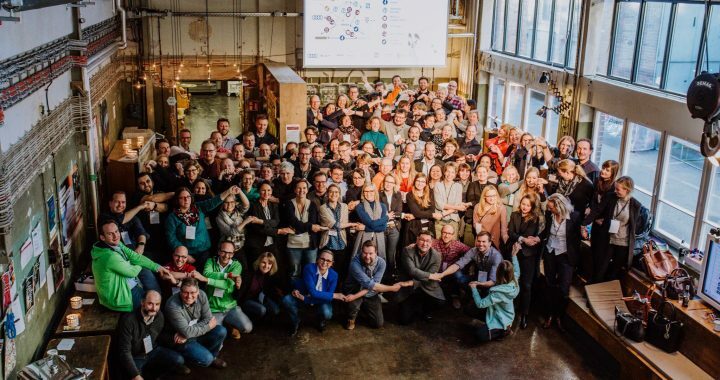 Thank you all for putting your energy into making this barcamp happen! And of course, not to forget about the other individuals that worked very hard prior to the event and behind the scenes during the event to ensure smooth sailing! Well done, team!! Traditional conferences, where you first get haggled into attending, pay a lot of money even with a steep discount (because, well it is you! ), have high expectations because you still paid lots of money, are stuck in a windowless, heartless and soulless conference hotel, are surrounded by bloodless people in suits, stick to the one person that you seem to have something in common with because you are tired of the same old small-talk conversations, sit through endless presentations that all talk about the WHY and WHAT, but rarely about the HOW, are forced to „network“ with vendors because they paid even more money than you to attend, eat the typical conference food and are more engaged with your mobile than with the conference because you simply cannot bear it. WOL Barcamp, where you pay kind of a symbolic fee, are cordially invited with the best intention, are welcomed by friends and strangers alike as if you were best friends, can feel the excitement prior, during and after the event, learn about the HOW, have no obligation to share but you do it because you want to pay it forward to others, eat delicious food in a remodelled workshop and just feel completely in the right spot at the right time.